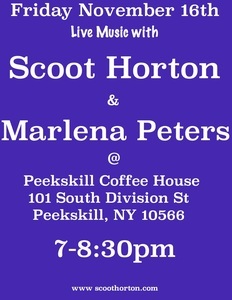 Scoot and Marlena return to the Peekskill Coffee House to play their blend of country/folk/pop songs. Original and covers. Scoot brings his original country/folks songs with a slight edge. You can call it Outlaw Folk or Cowpunk. Whatever you call it, it's Scoot. Marlena brings her beautiful voice to popular songs and duets with Scoot.